Last weekend I realized that Valentine's Day is almost upon us and I didn't really have any themed activities prepared for my students. They always really seem to get into the holidays, so I sat down and made a few materials for us to work on this and next week. 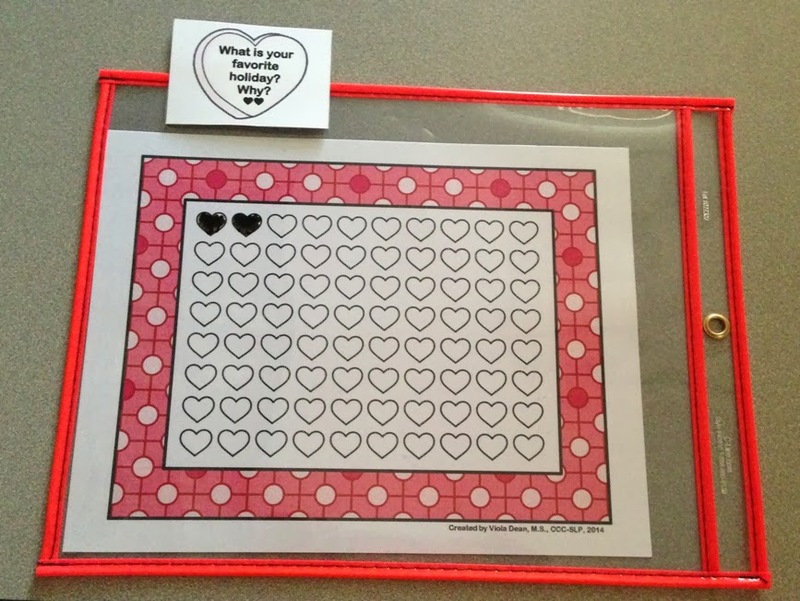 A few months ago I had purchased some cute Valentine candy clip art which came in handy in creating a conversation hearts activity to practice pragmatics, expressive language, and articulation generalization skills. The objective of the game is simple: Answer a question and earn as many heart points as you can to win. 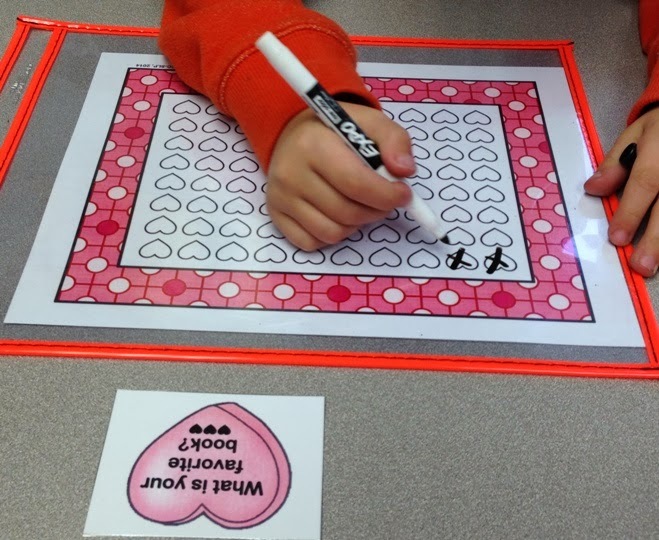 When it is a student's turn, they draw a conversation hearts card. These cards contain conversation starters and personal questions. If they answer the question using good pragmatics, grammar, or articulation, they earn the points depicted on the bottom of the card. 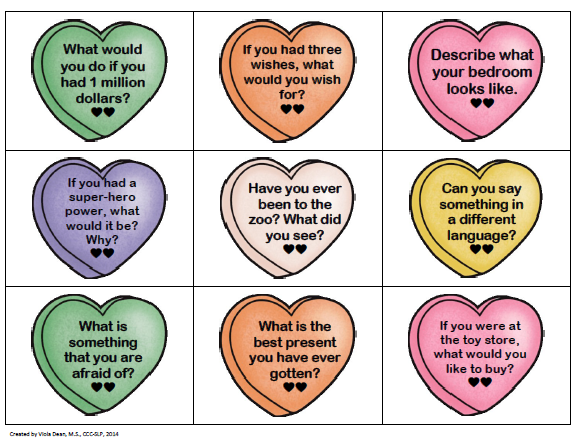 An example of the conversation heart cards. Once they earn the points, they mark the number on a score sheet. See-through plastic pouches or sheet protectors work wonderfully for this and save paper and ink. 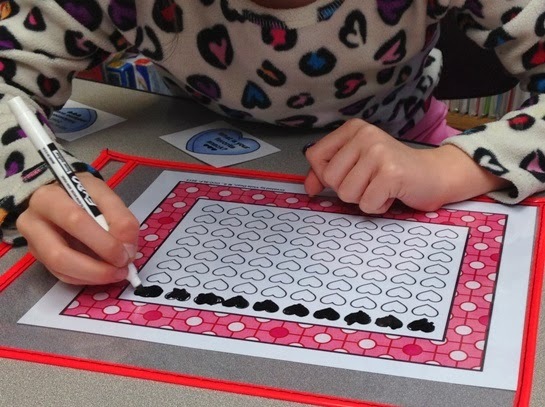 I told students that they could either color in the hearts or just mark them with an X, depending on their personal preference (a lesson I learned today is that some students are meticulous about coloring in the lines, which can make it take forever). My 1st grade boy preferred making X's. My 1st grade girl preferred coloring the hearts. All in all, this activity was a lot of fun for my students. They couldn't wait to see who would have the most points by the end of our session! And the best part is, I can re-use this activity again and again. It is available for purchase in my TpT store here. This game is available here. 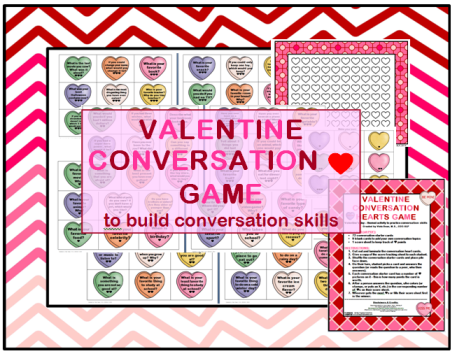 I have some more cute VD activities planned, and I am hoping to trial them and post updates soon! Happy Valentine's Day!